Moritaka Mashiro and Akito Takagi are Ashirogi Muto. Yay, it’s finally over! 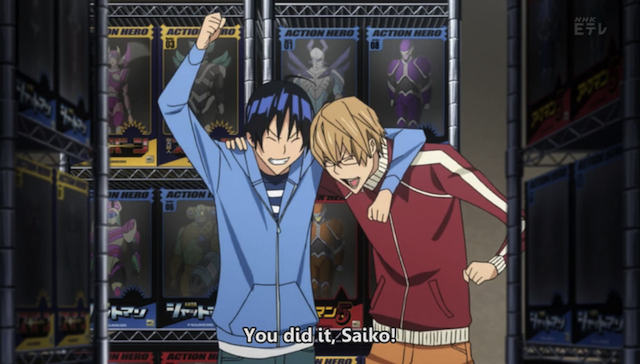 No, a third season of Bakuman has been announced. Honestly the second season showed significant improvement over the first season in several ways. First, it had some great dramatic moments, second, it didn’t waste as much time on the romances, third, the artwork was definitely improved, and finally, it ended strong. If the series had been more consistently like episode 25, I would probably say this was a pretty good series. Unfortunately Bakuman hasn’t demonstrated the ability to consistently string together entertaining episodes. When it is good, it is very interesting, because the premise is so unique, and people have told me that the arc that recently ended was some of the weakest material in the manga, so I guess I understand why a third season is forthcoming. I also think it is a positive thing for J.C. Staff to be working on, because it is so unlike their other shows, which have a tendency to be formulaic. I just can’t feel excited about a third season. Well if it makes it any better things seem to be wrapping up relatively drama free in the manga right now, though I don’t exactly think they’ll end it because of that. But anyway while I’m not too sure on the second season, I’ve enjoyed what I’ve seen but it just doesn’t seem as if it’s worth the time, if only it was running indefinitely like other Jump titles. Things do tend to continue to get progressively better though(anything with Hiramaru is gold), but there are a few arcs that just aren’t as good. I also can’t help but feel that Ohba is writing it on the fly either, it can be pretty impulsive at times. Other than that I wouldn’t be too surprised if they up and announced a fourth season not that long into the third, Bakuman is surprisingly popular. Yeah, this series. I am just so ambivalent about it. Honestly it seems like such a great idea, that I have a hard time giving it up. And SOMETIMES it has actually carried through on the promise, but only rarely. I certainly am not making Season 3 a priority, but every once in a while I am looking for something to watch, so I probably will turn to it eventually.